The third in a set of four ornament groups featuring checkered borders or motifs. 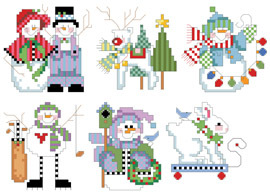 Snowmen and snowy animals are included in this batch of six ornaments. Contents: Stitch count is 35 wide by 35 high. If stitched in 14 count they would measure 2.5" by 2.5".